There is a school of thought which regards Labor Unions as being inherently Socialist, and therefore Un-American. 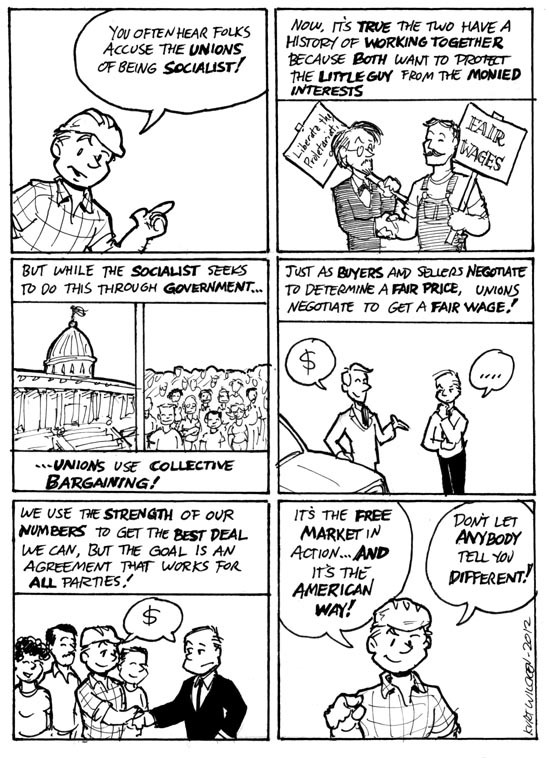 It seems to me, though, that the driving principles behind Unions are based firmly in the Free Market: trying to bargain for a fair wage and fair working conditions. I drew this cartoon in 2012. In 2015, the Wisconsin State Legislature is considering, and will almost certainly pass, legislation restricting worker’s ability to organize and unions’ ability to operated. Apparently Government interference in the Free Market is okay when the thumb is on the other side of the scales.